The Harbour Rocks Hotel is the perfect Sydney hotel accommodation choice, a popular & exclusive “home away from home” for discerning travellers and the perfect base from which to explore the city of Sydney. Perfectly located in ‘The Rocks’ and just a short stroll from some of Australia’s best icons the Sydney Harbour Bridge & Opera House, this Sydney boutique hotel accommodation offers a variety of stunning guest rooms to choose from. All to suit the needs of both the professional business and experienced leisure traveller. By making an online reservation on The Harbour Rocks Hotel website, you are guaranteed to obtain the best rate available – this is our promise to you. Sydney is overflowing with culture, cuisine and character; it is made up of many neighborhoods that each have their own identity. As with any city, one of the best reasons to visit a Sydney is to explore as many neighborhoods as you can, getting to know Sydney from the perspective of the locals in each district. The Rocks district is no exception. The Rocks accommodation is special because it puts you in a position to enjoy Sydney from a unique perspective. Harbour Rocks Hotel is a particularly special hotel in The Rocks District. The hotel offers unique, varied accommodation types from basic rooms to a luxurious suite with stuning views of the Sydney Harbour. Dining at the Harbour Rocks Hotel far exceeds that of other hotels in the area while the specially trained staff will make you feel both at home and in constant care. Check out all of the reasons Harbour Rocks Hotel is the best accommodation you’ll find in Sydney and all of The Rocks ! Accommodation options in The Rocks region are extremely varied, ranging from entire air BnBs apartments to luxury hotels and everything in-between. The benefit of staying in a hotel over an apartment is a team of staff to help accommodate your needs, like at the Harbour Rocks Hotel. The Harbour Rocks team is particularly satisfactory, providing a specialized team of staff available at all hours for all guests. While plenty of accommodation the Rocks has can boast an adequate team, few offer such hands-on, personal service, delivered with a smile. Another entitled Great Staff! reads: “…the most exceptional staff staff that we’ve had anywhere in the world…fabulous rooms can be fund anywhere, but a staff such as this is a rare find.” Talk about a shining review! Hell to the Yes says that the “…staff were perfect hosts”, truly a compliment. It is reviews like theses that have earned Harbour Rocks hotel one of the top slots of Rocks Accommodation. Service not only delivered because it has to be but because each Harbour Rocks team members wants you to enjoy your stay. The Rocks District is uniquely Sydney, offering a peek into the capital city’s past without sacrificing the modern luxury that has managed to engulf the rest of the city. The Rocks is home to much of the original architecture with which is was originally established, including cobblestone streets, thatched roofs and sandstone buildings. In fact, The Rocks gets its name from the various forms of stone that make up the neighborhood. The district is perfect for any travelers, home to history and shopping, fine dining restaurants and food stalls, artists and jewelers to name just a few! It is even conveniently located nearby the Sydney central business district, for those in Sydney on business ventures. What can you expect to do in The Rocks? Eat & Drink: The Rocks offers a departure from the hustle of the Sydney Central Business District and the overcrowded tourist spots. It is a place to have a late breakfast, a leisurely lunch or a five-star dinner while gazing over the iconic Sydney Harbour. 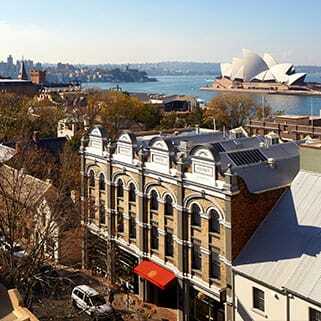 The Rocks has over fifty cafes, restaurants and hotels “to spoil yourself, and your appetite”. Some of the most notable drinking and dining options include Altitude Restaurant and Blue Bar on Level 36, with sprawling views of the Sydney Harbour and skyline from high above the city. There are also several old-school Italian pizzerias and traditional pasta menus along with a handful of small cafes for a midmorning or midafternoon coffee and pastry. Or check out Creperie Suzette, Harbour Rocks Hotel’s authentic French creperie that serves up savory and sweet crepes in a converted vintage souvenir shop. 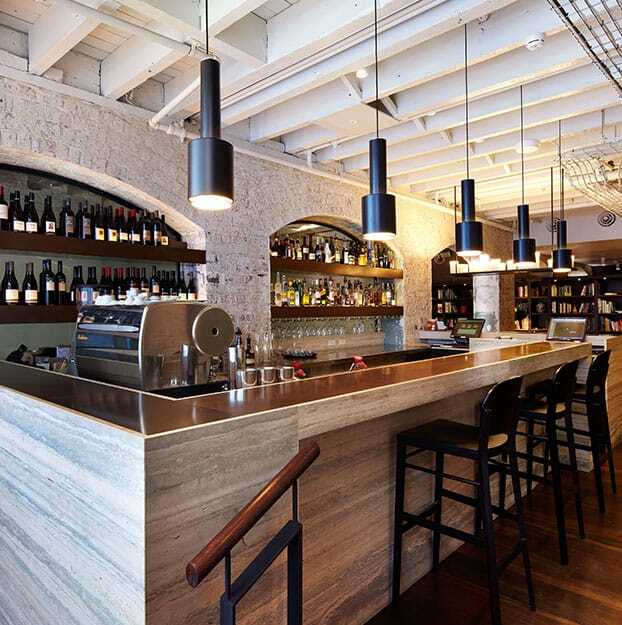 The Rocks embodies Sydney’s reputation as an international food hub in Australia; make a reservation at your favourite place or come explore several options in your free time. There is something for even the pickiest, most difficult-to-please palettes. Learn & Explore: Sydney and The Rocks District were the first settling places of European settlers in Australia. As such, it is steeped with history and timeless opportunity to learn about the evolving culture that makes up the city and Australia as a whole. While much of Sydney’s growth occurred in the late twentieth century, many of the buildings and public spaces established in the eighteenth and nineteenth century still remain intact in The Rocks, offering an authentic look into Sydney’s past. Book a walking tour, visit any of the museums including the Susannah Place Museum or the S.H Ervin Gallery or just stroll the street on your own and take in the historic architecture. It is truly a shopping experience you will never forget. 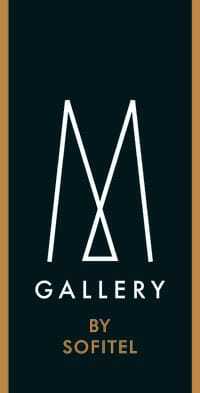 Browse handmade beauty product stores, contemporary jewelry galleries and genuine leather goods. Or take home a small-batch made cosmetic product, something personal for the home or even a hand-died piece of denim. The opportunities go on; check out Gifts at the Rocks for a one-of-a-kind souvenir for you or friends back home or try your hand at Mancuso Diamonds for something that will only grow in value as it ages with you. The Rocks shopping will not offer your typical designer goods or name-brand shopping malls; instead enjoy something different and personal from The Rocks Shops. Browse the Markets: The Rocks Markets, 10am-5pm on Saturdays and Sundays, offers even more special goods, most handmade. Since most days the weather in Australia is beautiful, it only makes sense to take advantage and host open-air markets for visitors to stroll through. Take in the local culture and handmade artwork as you leisurely hop from booth-to-booth, speaking with the artists and sellers, getting to know the real Sydney, up-close and personal. It is rare to find so many original pieces of artwork, home and body products in one place. Take a break from your sightseeing, business or hectic day at The Rocks Markets. Want an even closer look at the genuine Sydney? The Rocks Friday Foodie Market is held Fridays (no surprise) from 9am-3pm. Absorb not just the sights but the smells and tastes of the authentic Sydney at the Food Market with stalls to delight any taste buds. From specialty chocolate and baked good stands to cuisine from all over the world, enjoy a whole meal or sample a little bit of everything. Seasonal Activities: There is always something happening in The Rocks, no matter what time of year it is. Come listen to hours of out live music, participate in a Geotour or join a happy hour event. There are even art installations, themed Harbour cruises and rotating theater performances; a trip to the Rocks is different every time you come! The are many hotels at The Rocks Sydney that make up it’s accommodation. Finding a hotel for you or your family’s specific needs can be tricky; the Harbour Rocks delivers to both families and also to solo men and women traveling for business. Check out all the specific, unique features the Harbour Rocks Accor Hotel Sydney can guarantee you during your stay! Harbour Rocks Hotel is walking distance to all of the highlights of The Rocks without sacrificing affordability or room size for its opportune location. While many hotels in The Rocks Sydney similarly deliver on location, Harbour Rocks Hotel blows the rest out of the water for quality of service, as previously mentioned, and room quality. 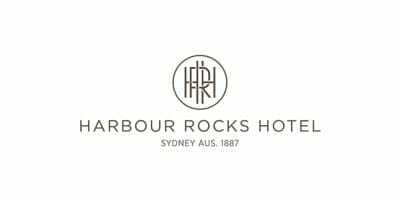 Harbour Rocks Hotel has a variety of rooms, ranging from the most basic to luxurious harbour room suites with views of the Sydney Harbour and a private rooftop deck. But whatever your budget, every room at the Harbour Rocks will exceed your expectations! Each the Rocks accommodation at the Harbour Rocks Hotel embodies the authenticity of the district it is nestled within, with historic charm and rich colors reminiscent of the past. Feel at ease in any room you choose to stay. The “basic” Heritage room is anything but basic, with all of these amenities and more. The Heritage deluxe room features everything the Hertitage room does with the added benefit of more space. Studio suites reflect the comforts and charm of the heritage rooms with even more space, offering a sitting room as well as a bedroom and bathroom. Ideal when staying with more people or for longer stretches of time. The Harbour View Suite is particularly luxurious. The suite is more accurately defined as an apartment, giving you ultimate privacy without eliminating the convenience and indulgence of a team of hotel staff. With a separate bedroom, open plan lounge and sofa bed, full dining area and deluxe bathroom with a bath and full walk-in shower with rain showerhead. The rooftop terrace features stunning views of the Harbour; dine in privacy with the best views at the Harbour Rocks Hotel. Accommodation Sydney Harbour has always been competitive; everyone wants a piece of that iconic view and to be close to the action. Whether you are a local looking to spend a special night away from home or a tourist on holiday, finding hotels Sydney Harbour facing is likely on your mind! Sydney Harbour hotels have typically been regarded as some of the best but often that means they come with a sky-high price tag too. The Harbour Rocks Hotel beats any harbour view hotels The Rocks district is home to, in both style and price. 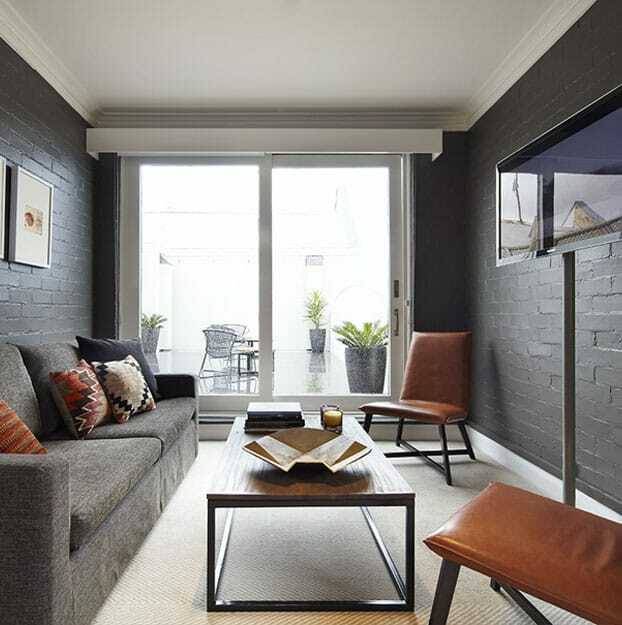 In any review of The Rocks District Sydney Harbour accommodation, you will likely see that the location is ideal. What sets Harbour Rocks Hotel apart is everything else that accompanies the accommodation. World-class service, tons of dining options and luxurious amenities in each room name just a few. "Hotels Sydney Harbour" shouldn't be your only search; go straight to the Harbour Rocks Hotel for the best of all hotels in Sydney Harbour. There really is no competition when it comes to which the Rocks accommodation to choose. Harbour Rocks Hotel gives you access to the unique Rocks District, the central business district and Sydney’s major tourist attractions all within your budget. Choose The Harbour Rocks for your next trip through Sydney, whether solo, with your family or on a getaway weekend with friends. With so many choices for accommodation and an award-winning team of staff, it is clear to see why Harbour Rocks has so many repeat guests that call the Harbour Rocks “home away from home”. Don't waste your time searching hours for hotels in Sydney Harbour. 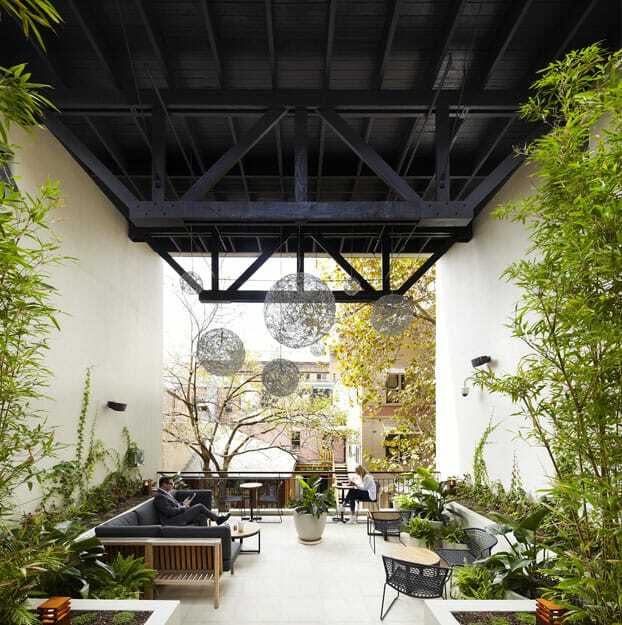 Book your stay at Harbour Rocks Hotel in Sydney’s Rocks District and see for yourself! Purchase accommodation and dining vouchers as well as tickets to our special events such as our Christmas Day Lunch or New Year’s Eve.